Hezbollah Profits From Hash as Syria Goes to Pot – The Daily Beast, 9th. July 2014. Despite hundreds of millions of dollars spent by the United States in recent years to fight drugs in Lebanon, cannabis has become a cornerstone of agriculture and the economy. BEIRUT, Lebanon — As you drive along the provincial roads of the Bekaa Valley, a region that stretches for about 75 miles from Mount Lebanon to the mountains next to the Syrian border, it’s not uncommon to come across marijuana plantations extending almost as far as the eye can see. And as the Syrian conflict deepens, Lebanese hashish and marijuana growers are increasing productionalong with profits.Local politicians know about it, police know about it, the Lebanese army is aware of it and so are authorities in Beirut. But nobody wants to, or can, fix the problem. The majority of these plantations are controlled by Hezbollah.“The police and the army can’t stop me even if they wanted to,” says one of the farmers working on a plantation not too far from Baalbek, Hezbollah’s de factocapital.Before the Syrian uprising turned into an outright civil war, the Lebanese armyroutinely entered areas of the Bekaa Valley to destroy fields and crops to keep drug trafficking at bay. Extensive security operations of this kind have been made possible thanks to aid provided by the United States government to the Lebanese Armed Forces (LAF). State Department numbers show the United States has provided $1 billion since 2005, and since 2007 over $140 million have gone to the Internal Security Forces, who are responsible for keeping drug trafficking at bay. The U.S. embassy in Beirut declined to comment when queried about the extent and effectiveness of its assistance in the war against drugs. In the current environment producers are able to grow their crops unchecked and are able to traffic their drugs undisturbed from ports in the mostly Hezbollah-controlled parts of Lebanon and overland all the way through lawless Syria, a country where Hezbollah is fighting on the side of President Bashar Assad. As a result, Lebanese marijuana and hashish is today able to reach the Jordanian, Iraqi and wealthy Dubai market with ease. But most importantly it serves the growing demand coming directly from Syrian consumers. Last year production was so abundant that consumers enjoyed a sharp drop in prices: a “bundle” (about 6 ounces) of an average-qualityRed Lebanese (the most common type of hashish produced in Lebanon) went down from $50 to $30 in just over a year. 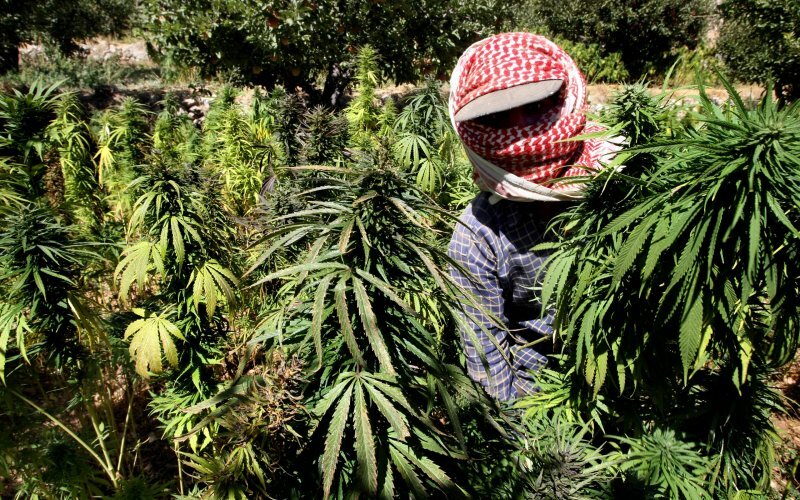 Marijuana plantations and hashish production are, of course, nothing new in Lebanon. Such illegal farming has been common since the 1970s, when the 15-year-long civil war created the perfect environment for a production boom. The country was divided, factions took over control of different areas and hashish production represented the easiest ways to make fast cash, buy weapons and provide an income for the fighters. What’s different is that the fractured societies and lawless regions that once seemed particular to Lebanon now afflict the entire region. In what is not too far from a feudal system, people often feel more committed to the local family than to a state that has long neglected them. A legacy so strongthat often farmers open fire on the army when it enters the area to try to destroy fields. The most famous of the clans is Zaiter. It is headed by Noah Zaiter, considered one of the more powerful men in the country. His influence is so great that Lebanese claim he once publicly stated “make Marijuana and hashish legal for six months and I’ll pay down all government debt,” which is around $36 billion. As the conflict across the porous border continues with no end in sight, tourism in Lebanon (a sector that accounts for roughly 25 percent of the local economy) has collapsed, transactions in the high end of the real estate market (roughly another fifth of GDP) have slowed significantly and food exports, a sector accounting for about 17 percent of GDP, have plummeted because it’s impossible to travel through Syria with legitimate crops for other Arab markets. So as Syria fights, the Lebanese economy crumbles and hashish becomes an even more important form of income for an even greater number of people. The cost of starting such business is also incredibly attractive. To irrigate a dunum (roughly 0.25 acres) of potatoes the cost stands at about $1,000, while for a marijuana field the cost of irrigation is around $400. Growing dope make sense at a time when almost nothing else does.